As winter gives way to spring in nature’s seasonal dance, keep one superfood recipe handy all year: bone broth. 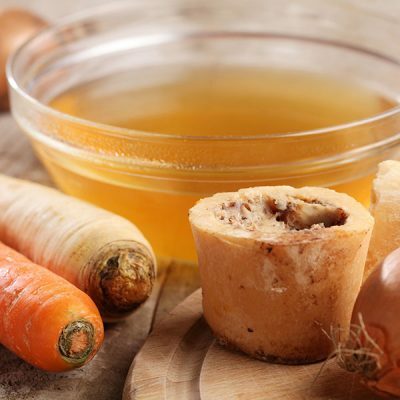 Not only for winter, bone broth’s incredible flavor and nutritional profile should ensure its place at your table year-round. In addition to stewarding a diverse farm with unusual animals from ancient breeds, Dr. King is also a doctor of naturopathy and chiropractic who has prescribed bone broth to his patients for 40 years with remarkable results. Bone broth is an ancient healing food that has been used in traditional cultures for millennia. And with today’s busy lifestyles, we need all the super-nutrition we can get! Bone broth is extremely versatile, and many chefs use it as a base for soups, gravies, sauces and more. In addition to using bone broth as a base for everything from soups to stews, you can enjoy it in a mug as a nourishing warm drink, or you can cook veggies in it for added nutrition. Our Chef Greg likes to pour his bone broth into ice cube trays and freeze it to use in his dishes as needed. He pops 2-6 cubes out every time he cooks, to add extra nutrients to any meal.